The Real Limitless Pill? Fat Chance!! The Real Limitless Pill? – Fat Chance!! Home » Nootropics » The Real Limitless Pill? – Fat Chance!! I see these headlines screaming at me day after day on social media and random news sites, and they just keep on coming. If you’ve seen the movie “Limitless” starring Bradley Cooper, then you probably know what I’m talking about. The pill is called NZT 48, and in the movie Bradley Cooper uses it to achieve fame and fortune, and also screw over Robert Deniro in the process. If you don’t remember the movie I’m talking about, maybe this “fake ad” will explain a little bit more of what the Limitless Movie was all about. Basically, the main character in the movie was played by Bradley Cooper, who stumbles upon a drug that makes him. He writes a book in like 3 days, conquers Wall Street, learns 6 languages, and masters the art of kung fu. All from one little clear pill. I mean really, how cool would that be? There’s a few prescription medications out there that have attempted to define themselves as smart pills, including Adderall, Vyvanse, Ritalin, and Modafinil. They do work wonderfully, but not without a wide range of side effects and potential for addiction that keep a lot of people from crossing that bridge. 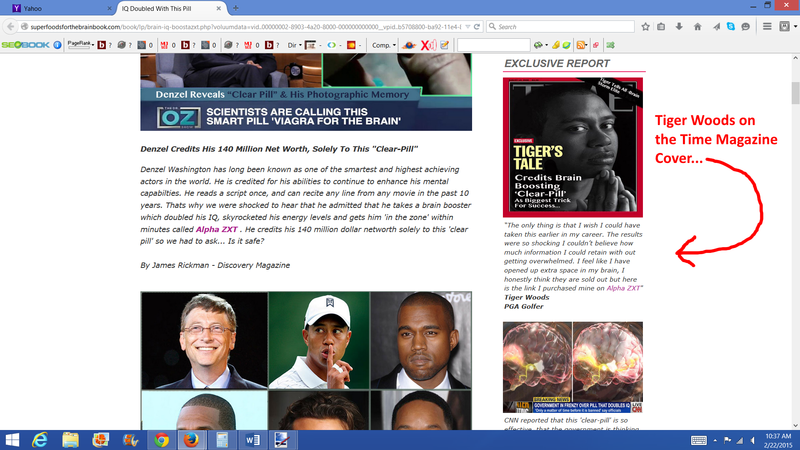 But, let’s imagine for a second that there was a real “Limitless Pill” that was an all natural supplement. One that could help you achieve mind blowing focus / concentration, motivation, and drastically increase your short and long term memory. A REAL over the counter adderall equivalent. You probably would, and there’s certainly no shortage of companies hawking supplements to us claiming that they are the “real deal” limitless drug. However, these headlines cover up a dark and sinister underground world of deceit, those of which involve fake celebrity endorsements, fake articles (farticles), and a very deliberate and methodical attempt of separating thousands of hard working Americans from their money. Over the course of the last 6 months or so we’ve seen literally DOZENS of this ads, and each one has a different pill they are slinging. The purpose of this article is to EXPOSE these fake products for what they REALLY are, and to help you save you time, money, and a lot of hassle. We posted a review of Addium back in January of this year, and the reviews (mostly negative) started to pour in. Addium has to be, by far, the most heavily marketed / promoted supplements I have ever seen, and has resulted in hundreds of people commenting on it and reviewing it on my site. Throughout that marketing, you’ll see lots of intriguing evidence that this just “might” be the real limitless pill. There’s references on Twitter to the movie “Limitless”, starring Bradley Cooper, and how Addium was quite literally the inspiration behind the movie. Another thing you’ll see if a Forbes magazine article called Addium “Viagra for the brain”, and said it was given an honorary mention as the pill that can turn you into the quickest thinker on the planet. Finally, you’ll see dozens (if not HUNDREDS by now) reviews on Amazon talking up the supplement, saying things like “I found my thinking to be clearer” and “I can express myself better”, among other claims. However, as you’ll see in my official review, this is simply deliberate and FALSE marketing designed to make you think this is some “miracle” brain enhancer. Read more in my official review of Addium here. One of my visitors actually pointed this one out. Remember the movie Limitless I was talking about earlier? Well, in that movie the name of the drug Bradley Cooper uses a pill called NZT-48, which is clearly what the makers intended to align when they were designing the product. The first thing I noted about MZT 48 was the label was nearly IDENTICAL to that of Addium and Adderin. Like many of the others you’ll read about on this page, MZT 48 uses the same clever (yet deceptive) marketing to promote their product. In fact, they even claim that CNN’s Anderson Cooper used it for a period of 2 weeks with extraordinary results. Click Here to read more in my MZT 48 review. The first time I heard about this product, I actually thought it was a car. “Test Drive the all new Acura Alpha ZXT at your local dealer today” sprung to mind. Well, it turns out that it wasn’t a car, but rather a secret pill that celebrities were secretly using to help give them an edge. Those celebrities?? None other than Bill Gates, James Cameron, Tiger Woods, Will Smith, and even renowned theoretical physicist Stephen Hawking are using it. 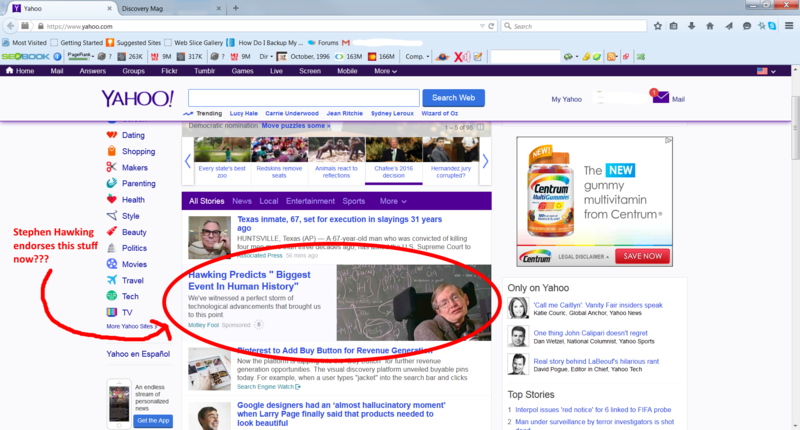 They even quoted Mr. Hawking as calling it the “The Biggest Event In Human History”. Then, as I did my research, all of the chips started to fall. I researched the article where Stephen Hawking was cited, and he wasn’t talking about Alpha ZXT…he was talking about AI or Artificial Intelligence as being the next biggest event in human history. 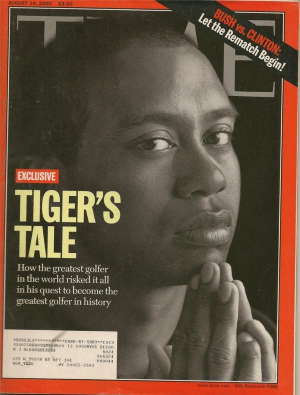 And that Time Magazine Cover featuring Tiger Woods, exclaiming “Tiger’s Tale: Credits Brain Boosting ‘Clear Pill’ As Biggest Trick for Success”?? Totally Fake…Here’s a picture of the real cover. You can see more in my review of Alpha ZXT here. Yet another nootropic based supplement that uses deceptive marketing is a product called Synagen IQ. I first learned about this supplement when I stumbled upon an article that appeared to be on the CNN official site. It showed screenshots of an interview of physicist Stephen Hawking being interviewed by Wolf Blitzer, with the headline screaming “We can now access 100% of the brain”. Throughout this “interview”, they mention a number of other celebrities who are apparently taking this miracle brain booster, including Denzel Washington and Ashton Kutcher. However, just like with Alpha ZXT above, I quickly realized this was COMPLETELY FAKE. There was no interview with Stephen Hawking, and I even watched through the entire Denzel Washington speech he gave and he makes no mention of Synagen IQ. I even got a chance to personally test out Synagen IQ, you can read all about my results in my official review here. Another one that uses the likes of celebrity’s to promote their product is none other then Neuro3X, which Will Smith reveals it as the one key to a limitless mind. 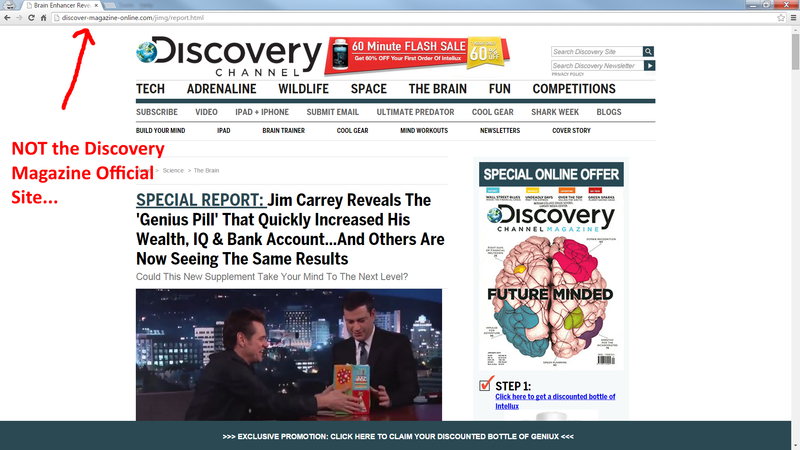 This time instead of using a fake CNN or MSNBC article, it’s a fake version of the Discover Magazine website, and they claim that Smith said that Neuro 3X literally “doubled his IQ in minutes”. 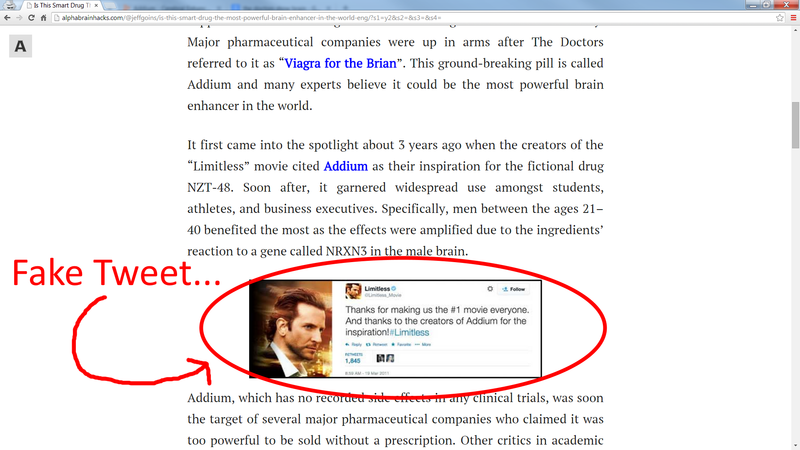 Just like Addium and Alpha ZXT, they also use the fake “Limitless” movie tweet that insinuates that Neuro 3X was the inspiration for the movie, as well as the Fake Forbes article. They even sunk as low as stating that motivational speaker Tony Robbins is using it, citing that it’s his ‘ultimate secret’ to unlocking his mind and achieving laser-like focus. You can read all about this one in my official review here. Intellux uses a slightly more deceptive approach to marketing their product. This time around, they are saying that Jim Carrey revealed on “The Jimmy Kimmel Show” that he’s been taking Intellux to quick increase his wealth, IQ, and bank account. 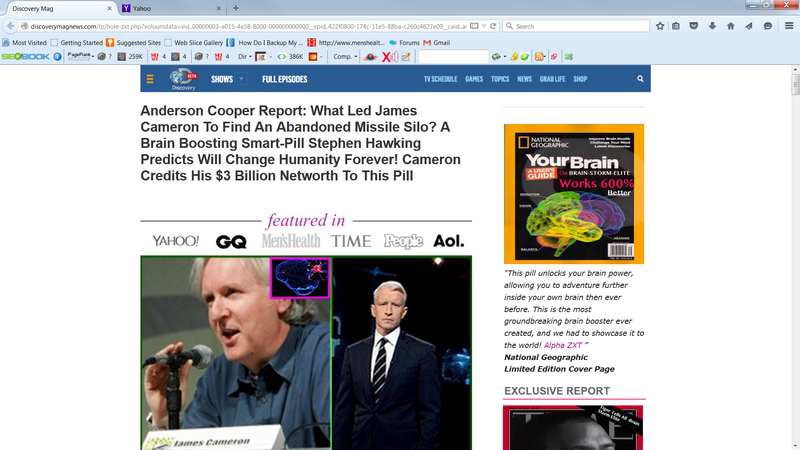 The stage for the Fake Article (or FARTICLE) is a Discovery News Mag website, which looks like the real thing. It’s rife with claims about other celebs using it, including Tom Cruise, Daniel Craig, and even tennis legend Roger Federer. They also point out that when Intellux is used in conjunction with another supplement called Geniux, the results are enhanced 10 fold. You can even find reviews of Geniux on Youtube talking about how great the supplement works and claiming that they’re not paid sponsers. Like Alpha ZXT and Addium, however, it’s all a load of B.S. Read more in my official Intellux review here. 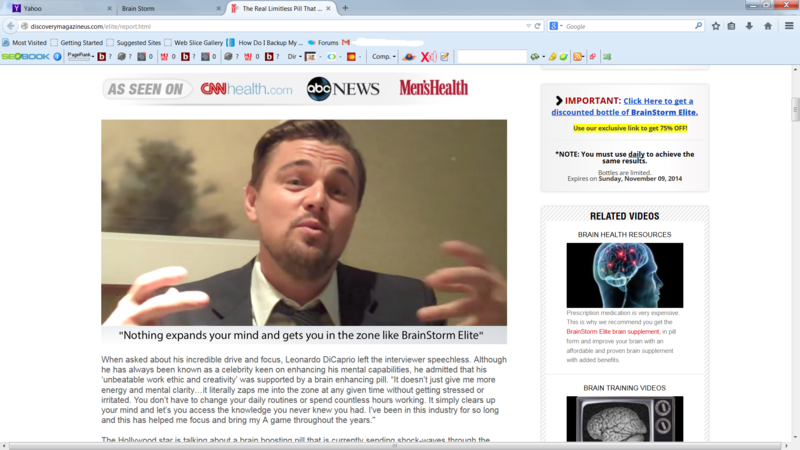 “Nothing expands your mind and gets you in the zone like Brainstorm Elite”. That was a direct quote from none other than Leonardo Dicaprio, award winning actor and producer, and humper of some of the hottest chicks in the world. In this Discovery Mag article, he supposedly talks about how Brainstorm Elite has given him unbeatable work ethic and creativity, as well as giving him more energy and mental clarity. Just like the others, there are plenty of other celebrities being referenced as using it as well, and the editor of this so called magazine editorial did his own short experiment with the pills to see if they really worked. But just like all the others, we did the research and proved that it was all smoke and mirrors. Read more in my review here. The link took me to a mock “NBC” website, saying that this supplement was featured on the TV show “The Doctors” and doctors were calling it “viagra for the brain”. As usual, the BS was complete with mentions of the movie Limitless, and all the usual celebrity suspects. They even go on to say that the FDA had originally banned the use of Adderin, but that 3 years of litigation and clinical studies proved it was safe and brought it back to the market. Check out my review on this one here. I found out about this one, again, via my Facebook news feed. Cogniflex claims people are “rushing” to buy it before it’s out of stock, yet unsurprisingly, can only be bought on it’s official website. It’s the “real” limitless pill. Celebrities and professional athletes are using it. It was featured in Forbes. And as usual, each claim was debunked. What’s worse is that Cogniflex invites people to try out their supplement via a free trial. This sounds great and all, until your credit card gets charged $140 10 days after ordering. Read more in my official Cogniflex review here. How Do They Get Away With This?!?! Are the editors over at CNN, Discover Magazine, and Yahoo all on crack?I mean, don’t these celebrities want to protect their image and likeness from being associated with these so called brain pills? Well, there’s a lot of sneaky tricks these companies use to keep scamming people out of their hard earned money, and stay off the Feds radar. Many of these fake ads / Farticles that you come across are not ACTUALLY being paid for by the companies that make the supplements. Rather, they are typically run by professional affiliates who use cloak and dagger techniques to game the system. 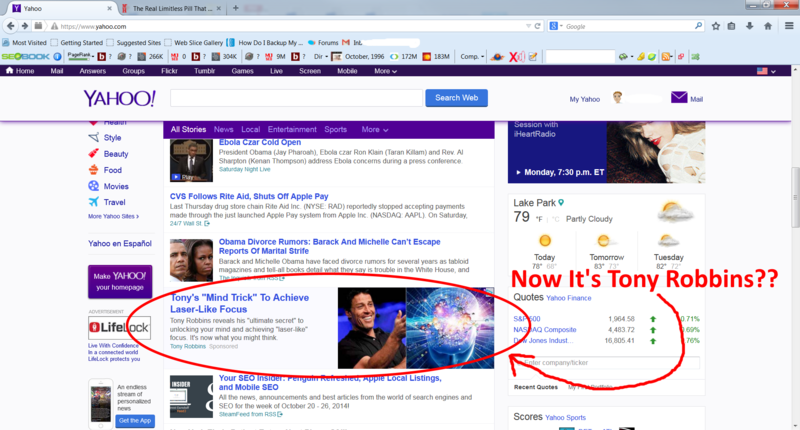 One of those techniques involves setting up a “legitimate” advertising campaign, which when it runs through the Yahoo advertising approval board, looks credible. Once the ad has been approved, the marketers simply use what is called a “redirect” to send people to a completely different page (the FAKE one), one that has NOT been approved by Yahoo. 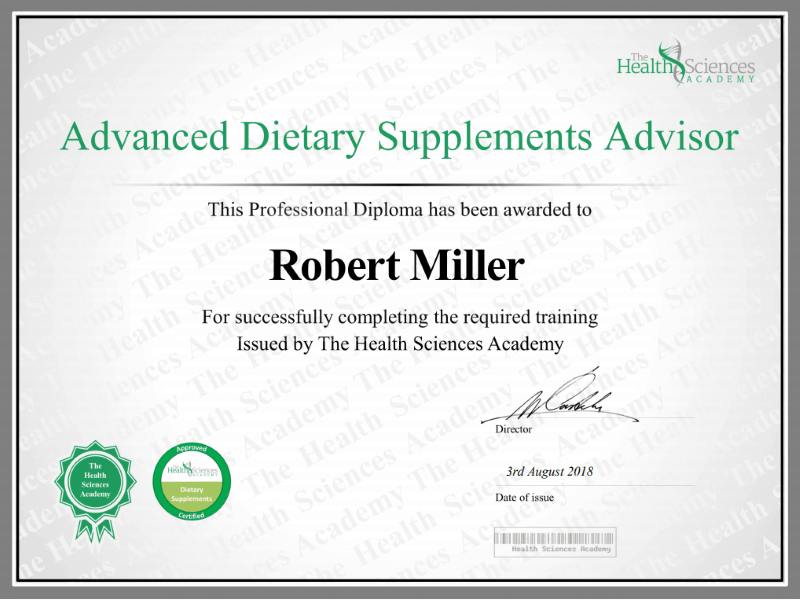 These affiliates are paid a certain percentage of the total cost of the product when you purchase it through one of their links, and many of them will do WHATEVER it takes to get you to buy the supplement in question. This generally results in them posting these fake articles, using big names like CNN, MSNBC, Fox News, and Discover Magazine to make it appear as though you’re reading a REAL article on one of those sites. Another thing I’ve noticed recently is many of the companies have been paying other sites to post “reviews” of their products, which are really nothing more then big sales pages. They make up a bunch of content that in most cases doesn’t even make sense to help them rank better in the search engines. They also will link to these pages from a wide array of other websites, all with the intention of boosting up their ranking and giving YOU false information. Meanwhile, sites like SupplementCritique.com that have ACTUALLY USED and tested these products are buried in the results. They do this because they don’t want you to see the truth about their supplement, and will do everything in their power to try and keep you from learning it. Once these techniques start to fail and the real truth starts to show up, typically what you will see if a “rebranding” of a new product, which is essentially the same as the old one. What do I mean by this? Well, take Addium for example…the truth is beginning to rear its ugly head, and you’ll see dozens of very negative reviews on Amazon, Ebay, and other sites. Word is starting to get around…So, instead of trying to beat a dead horse, the makers of Addium are re branding their product and calling it Adderin. 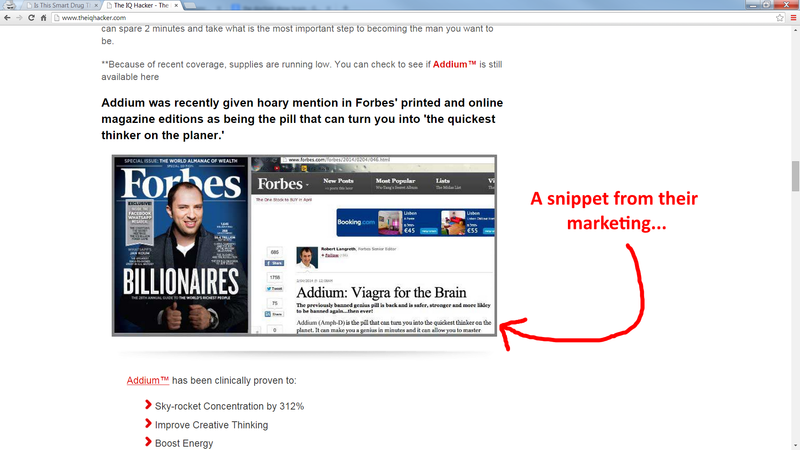 If you search for Adderin on Google, there isn’t any bad publicity yet. That’s because the product has just been recently introduced to the market. But, if you give it a few months, I can almost guarantee that youll start to see the truth come pouring out. How Can I Protect Myself From These Scams?? Well, the first thing you should do is bookmark my site. I spend THOUSANDS of $$ testing a wide array of products every year, and chances are if you are reading about it, I likely have a review of it somewhere on my site. Lastly, if you’re unsure whether the product you’re looking at is the real deal, send me an email. I’ll take a look at the marketing, the claims, and do the research and let you know if it’s a legit supplement, or complete bunk. Previous Previous post: Brain Peak Review – Should You Use It? Next Next post: MaxGXL Sport Review – Should You Try It?